On Wednesday 2nd of October Neil Spiller will talk about his three decades of work, Drawing Drawings and pushing the architectural envelope. This will be the second in the 2013/14 Open Lecture Series at the School of Architecture, Design and Construction at the University of Greenwich. The series that presents a diversity of architecture, art and landscape architecture leading practitioners and thinkers was opened last week by Will Alsop. Next week will see Heather Ring from Wayward Plants present some of her latest work. 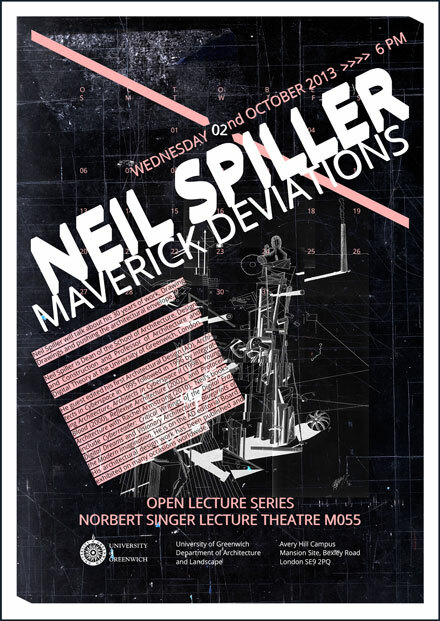 Neil Spiller is Dean of the School of Architecture, Design and Construction and Professor of Architecture and Digital Theory at the University of Greenwich, London. He guest edited his first Architectural Design (AD), Architects in Cyberspace in 1995 followed in 1996 by Integrating Architecture, Architects in Cyberspace II (1998), Young Blood (2000), Reflexive Architecture (2002), and Protocell Architecture with Rachel Armstrong (2010). Neil’s books include Cyberreader: Critical Writings of the Digital Era, Digital Dreams and Visionary Architecture – Blueprints of the Modern Imagination. He is on the AD editorial Board. His architectural design work has been published and exhibited on many occasions worldwide.